In the herb garden at The Garden at 485 Elm: Lroy, a 3rd-year student at the Vermont Center for Integrative Herbalism, guides gardeners in harvesting spilanthes flowers and making a tincture. The gardening commitment is two to four hours most weeks from late April through November. Gardeners participate in a combination of garden work parties and gardening on one’s own. We accommodate absences (for travel, etc.) with notice. We strive to match garden tasks with gardeners’ abilities and inclinations. An annual $60 materials fee per household includes all gardener expenses and food harvested. Contact Sheryl by email or call (802) 229-5400 for more information. Growing since 2014, the all-volunteer Garden at 485 Elm is a collaboratively grown community garden on the North Branch River. The Garden produces food, education, and community. The Garden includes a 1/4-acre fenced crop garden, “Compostville,” and .7 acre of riparian buffer plantings, pollinator gardens, and herbs. The Garden at 485 Elm is affiliated with the Vermont Community Garden Network. We are a certified volunteer site for the University of Vermont Master Gardener and Master Composter programs. The Garden at 485 Elm’s mission is growing local food, education, and community through collaborative community gardening. FOOD: The Garden offers affordable, accessible means for community members to grow and eat fresh, organic, very local food. We also donate fresh food to local organizations feeding community members in need. EDUCATION: First-time gardeners to long-seasoned gardeners learn from each other while growing food together. The Garden also presents interactive workshops, many of which are free and open to the community. Topics include gleaning, medicinal herbs, the life and health of the North Branch river, and yoga in the garden. We aim to be a true teaching garden, developing leadership and expertise from within for growing food, herbs, riparian buffers, and pollinator plantings. We believe anyone who digs in can become a gardener and, in turn, help others to become gardeners. 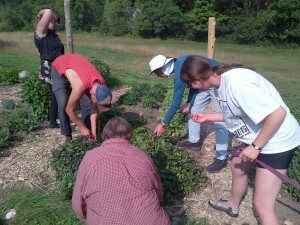 COMMUNITY: Gardeners at 485 Elm plan, plant, tend, harvest, and maintain the garden together, collaboratively. Group work parties grow relationships as well as food. Our garden community includes the human and natural environment. Through responsible and proactive practices, we strive to leave our corner of the world a better place than we found it, and hope to inspire others to do the same. The Garden at 485 Elm grows local food, education, and community through collaborative community gardening. The Garden increases food security, nutritional health, and the community’s skills for growing food, while improving the health of the environment where food grows and reducing the carbon footprint for producing and distributing food, and serving as a model in these areas. 485 Elm Gardeners work collaboratively to grow all the crops, each gardener performing needful tasks according to abilities and interests. Cooperative labor allows for a greater diversity of crops and quantity of yields. Gardeners harvest crops to feed their households, while additional yields are donated to local organizations feeding people in need. 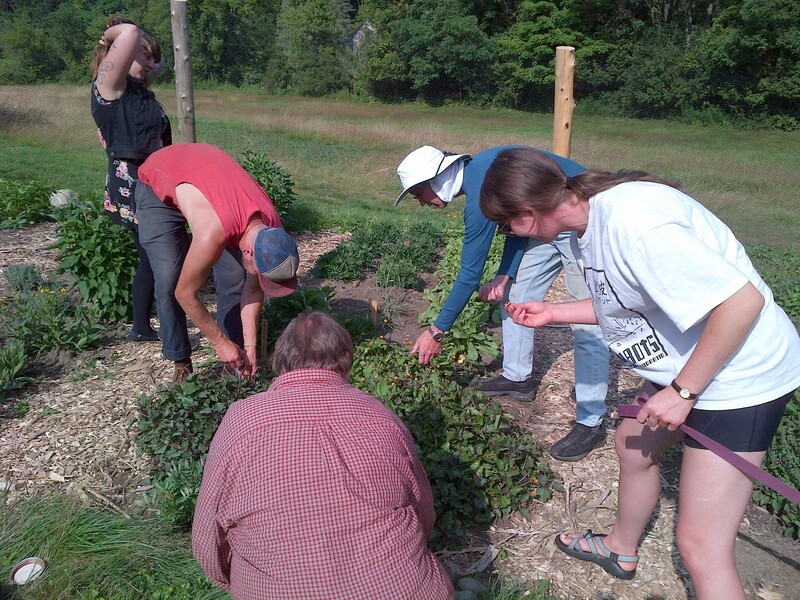 In our first season, Community Harvest of Central Vermont gleaned nearly 200 pounds of food here and delivered it to the Montpelier Food Pantry, the Montpelier Senior Activity Center’s FEAST meals program, and Capstone Community Action‘s (formerly CVCAC) Community Kitchen Academy. We have picked and delivered fresh vegetables to the Unitarian Church of Montpelier and Christ Episcopal Church free community lunches.The garden has donated seeds to organizations including the Barre City Elementary and Middle School’s garden and Vermonters for Puerto Rico. Our founding Medicinal Herbal Garden Coordinator donated donated medicinal herbs through Remedios and the Stone Cabin Collective. I drive by this every day and have wondered what was going on…SO FANTASTIC! What a great effort, and so beautiful to see it in motion, progressing, with new things happening every day. Love seeing this sort of thing in the neighborhood of Elm! Thank you! Elly, you warmed my heart. I know the other gardeners here will feel the same. Thank you so much for letting us know. Please stop by and say hello.